Definition: Foreign Exchange Market is the market where the buyers and sellers are involved in the buying and selling of foreign currencies. Simply, the market in which the currencies of different countries are bought and sold is called as a foreign exchange market. Transfer Function: The basic and the most visible function of foreign exchange market is the transfer of funds (foreign currency) from one country to another for the settlement of payments. It basically includes the conversion of one currency to another, wherein the role of FOREX is to transfer the purchasing power from one country to another. For example, If the exporter of India import goods from the USA and the payment is to be made in dollars, then the conversion of the rupee to the dollar will be facilitated by FOREX. The transfer function is performed through a use of credit instruments, such as bank drafts, bills of foreign exchange, and telephone transfers. Credit Function: FOREX provides a short-term credit to the importers so as to facilitate the smooth flow of goods and services from country to country. An importer can use credit to finance the foreign purchases. Such as an Indian company wants to purchase the machinery from the USA, can pay for the purchase by issuing a bill of exchange in the foreign exchange market, essentially with a three-month maturity. 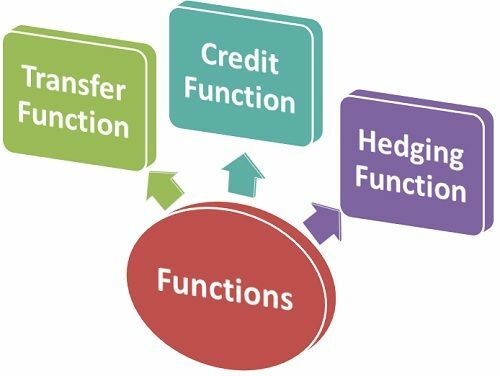 Hedging Function: The third function of a foreign exchange market is to hedge foreign exchange risks. The parties to the foreign exchange are often afraid of the fluctuations in the exchange rates, i.e., the price of one currency in terms of another. The change in the exchange rate may result in a gain or loss to the party concerned. Thus, due to this reason the FOREX provides the services for hedging the anticipated or actual claims/liabilities in exchange for the forward contracts. A forward contract is usually a three month contract to buy or sell the foreign exchange for another currency at a fixed date in the future at a price agreed upon today. Thus, no money is exchanged at the time of the contract. There are several dealers in the foreign exchange markets, the most important amongst them are the banks. The banks have their branches in different countries through which the foreign exchange is facilitated, such service of a bank are called as Exchange Banks. It’s very important articles, thank your sharing this information. It’s very usefull information, thank your sharing.